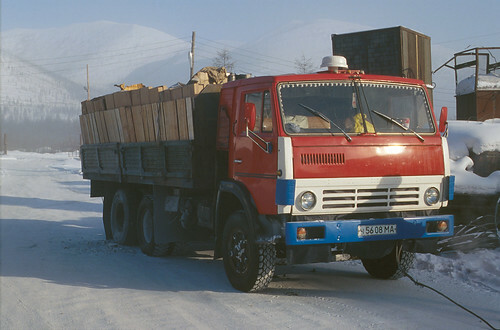 Kamaz trucks like this one were typically used to haul food and other supplies to the interior mines of the Far East. There were two in our convoy. At last, we are on the road!! 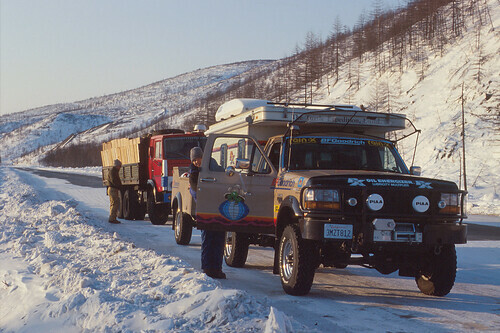 In convoy with two six-wheel drive Kamazes hauling frozen chicken and other supplies to the mining camps of Ust Nera, we headed west out of Magadan on the “Road of Bones”, so called because of the number of prisoners who died in its construction, and the persistent rumor that their frozen corpses were used in building the road bed. The drive along this frozen landscape was spectacular. Seventy-four miles out of Magadan, we climbed a low pass to 3,050 feet. The view of snow-covered mountains in the distance was increasingly spectacular. The snow along the road had been shaped by the wind into waves and fluffs which resembled whipped cream. The rounded mountains looked like giant mounds of sugar. The road alternated between two lane and one lane with just enough room to pass. There was little sign of snow plows. The track is kept open by the big six or ten-wheel drive trucks hauling coal east and supplies west. In sections, our differentials touched the center berm, but there was no resistance from the powder which swirled behind in our wake. The main hazards were the big coal and fuel trucks, and the chunks of coal, some as big as basket balls, falling off the coal trailers. In places the rough road was only one lane, which made passing anyone difficult. Fortunately, traffic was almost nonexistent. 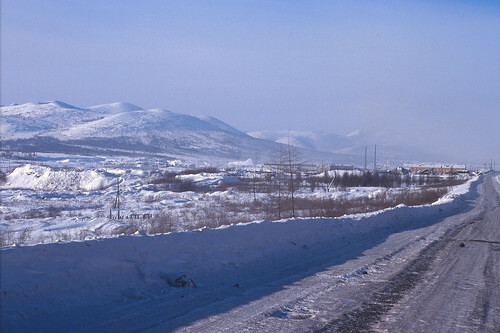 The road was frozen with only occasional coal dust (instead of sand) for traction. This trucker showed us the only running water along the Road of Bones. Heavy trucks had compacted the snow into solid ice, so even in four-wheel drive, there was never a moment to let our attention drift. On some of the steep sections, we could feel the tires slip and grab again. In such situations, our ARB locking differentials were already proving themselves invaluable, though any sudden stop would have been impossible. One must drive a half mile ahead. Studs would have been helpful. By 6:00 PM the sun was gone, and we continued into a tangerine-mauve of a Siberian afterglow. 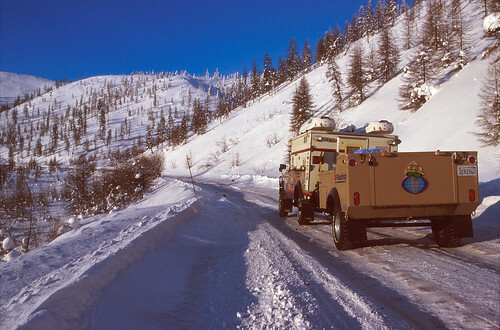 The scenery here was beautiful, and we were sorry to continue in the darkness, a drawback to traveling with a convoy. Wind had carved the snow. It often looked like whipped cream. 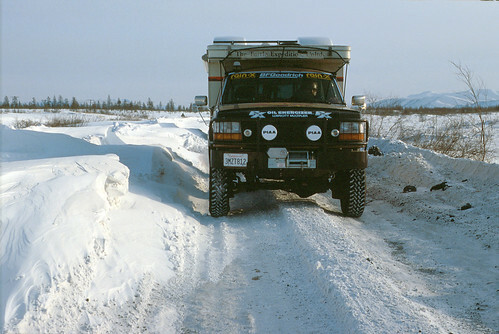 Several bridges were washed out or closed, requiring us to drive down and across the frozen rivers. We came to expect this as the norm. On one occasion we slid sideways for fifty yards, finally coming to a stop with the trailer jackknifed, only feet from the edge of a twenty-foot drop-off which had appeared in the darkness to be a perfectly good bridge. This section was rather treacherous. 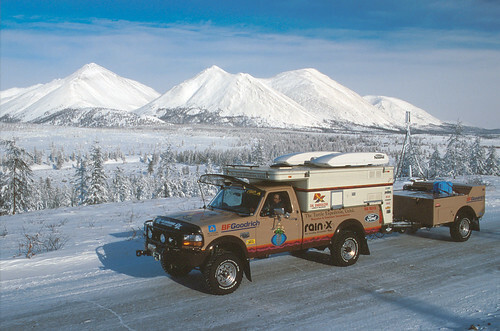 The outside temperature was holding at -47°F (-43 °C) when we stopped to uncap our PIAA 80 Pro driving lights. The extreme cold required cutting the covers off with a knife. Their far-reaching beams were welcome in the darkness of 2:00 AM, as we wound over switch-backs to a final pass (3,990 ft.) and snaked into the valley of Susuman. Little crystals of snow danced through our lights, the diamond dust of hoarfrost searching for a nest. Four-wheel drive gave us steering control on the steep descents, and we could only hope the trailer wouldn’t try to pass us. The sheer drop-offs into canyons were probably better left unseen. Our eyes and nerves were glued to the bobsled run descending in front of us. The town of Susuman was cloaked in what is called “habitation fog”, caused by human breath, homes and automobiles. The air is so cold, it prevents the fog from rising. To avoid our convoy’s belching exhaust, we had taken the lead, and unbeknownst to us, they had stopped with tire and engine problems, putting us over an hour ahead of them. We waited on the outskirts of town, wondering if we had missed a turn-off. An occasional convoy of heavy trucks were our only companions on the road. In this frigid temperatures, The Turtle IV stayed clean for over three months! We were into our second tank of fuel. Not knowing for sure when the next gas/diesel station might be, we had two choices. Leave the engine running—(We could always pump fuel from our trailer’s 100-gallon reserve of jet fuel, but we preferred to keep that for a real emergency. ),—or start the Powermate 5000-watt diesel generator in the trailer which would supply 110-volt AC power to the Zerostart battery, oil, engine block and cab heaters, and the auxiliary Pelonis 1,500-watt ceramic heater in the camper. With the temperature from the outside probe on our Peet Bros. Ultimeter reading –47 F, the generator seemed like the best bet to consume the least fuel. I jumped out and turned on the 12-volt BackSeat Heater inside the generator compartment. With the truck engine running, the Optima starting battery for the generator and fuel transfer pump would stay fully charged. We waited another half an hour to heat up the air inside the generator compartment. 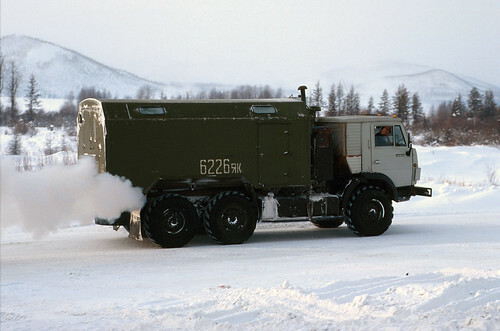 At length, with no sign of our convoy, I again ventured into the biting cold to start the generator. 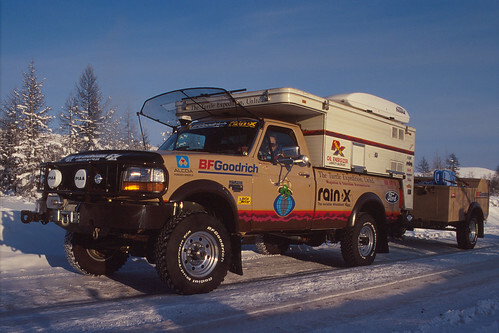 We had been warned by Coleman that –30 F was about its low limit, even with the special glow plug they had installed and the Racor fuel heater we had added. It took several 15-second crankings before it finally fired and stumbled to life. Its exhaust sounded like a firecracker in a tin can, a drawback of its Acme one-cylinder air-cooled diesel engine. 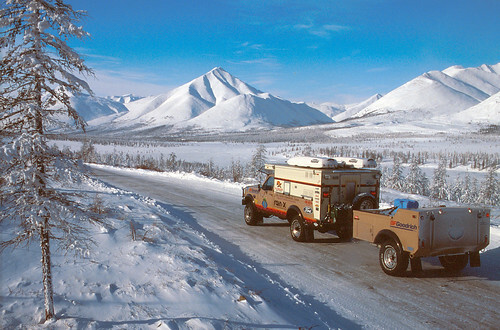 With all the heaters now running, we could turn the truck’s engine off and move into the warm camper which we had kept at a comfortable 70 F with its Hunter HW6 Hot Water vehicle heater, plumbed to the truck’s cooling system. This being our first day and night on the road, we still fumbled with procedures we had devised in California, but which had never been fully tested or rehearsed in –40 F weather. At this temperature, we dared not open the camper top. The pop-up vinyl sides could crack, and in any case the heat loss would be uncontrollable. We waited for our companions to catch up. 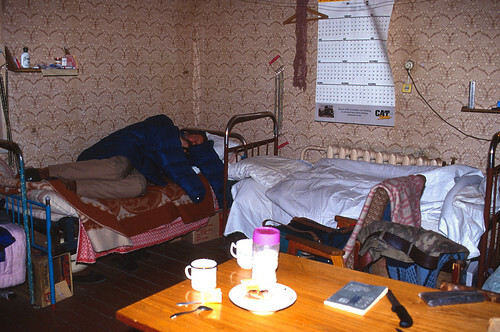 We had just gotten comfortable in the cramped quarters of the camper when the convoy arrived. We quickly shut down the generator and packed up to follow. Not wanting to become lost in the dense habitation fog, we tailed them closely, making visibility even worse because of the thick fog/exhaust spewing from the truck in front of us. Shortly we arrived at the freight company’s “auto base” where we would spend the night, a relative luxury, for we were able to park inside a huge heated truck barn, eliminating the need to start our generator again. The grease on the floor of the hanger-type building was thick with the stench of dead or dying machinery. Numerous trucks looked like they had been on the fix-when-parts-arrive list for years. Nevertheless, we were glad to have a safe place to park for the night. The shadows of stories about bandits, Mafia, road blocks, freak storms, and –96 F temperatures were still lurking in the corners of our experience. From the truck barn, we were escorted back to the main building, a two-story dilapidated wooden affair that listed badly into the thawing permafrost. The manager, or so we presumed, was rousted from his sleep; a fat, pudgy-faced Russian dressed in a dirty undershirt and faded sweat pants. His disposition you might imagine; a man awoken in the middle of the night and asked to vacate his room so that two foreigners could use it. Boxes were shuffled around to clear a second bed; an angle-iron frame the size of a cot, laced with bailing wire for springs and covered with a thin sheet of plywood and a two-inch matted cotton mattress, pocked with cigarette burns. 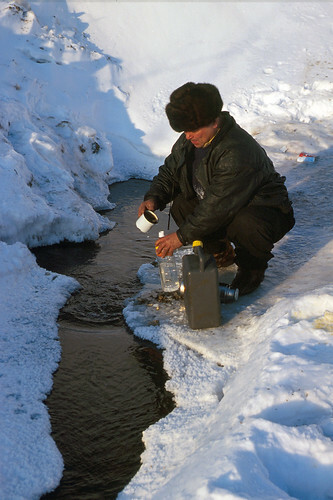 Russian Hospitality far and beyond. Two employees were woken up in the middle of the night to give up their beds for us! We thanked him as profusely as our limited Russian vocabulary allowed. He pointed a greasy finger at an electric tea pot and a plate of day-old donuts and grunted something hospitable. We thanked him again, not having the heart to tell him that we would have been much more comfortable in our camper. As we would see in coming days, the Russians didn’t have much, but they offered everything they had with generosity that was overwhelming. Surveying our surroundings, we placed our hats and gloves on the table—a used Caterpillar air filter—made some tea in the unwashed cups, ate a stale sweet roll, and without taking our clothes or boots off, laid down on the dirty mattresses and slept soundly till ten that morning. We were on the road!! The bureaucrats of Magadan were behind us for the moment. The Turtle IV was performing perfectly!! We were safe and warm!! What more could we ask for?! Mileage from Magadan to Susuman: 393 miles (633 km). Total time on the road: 13.7 hours. 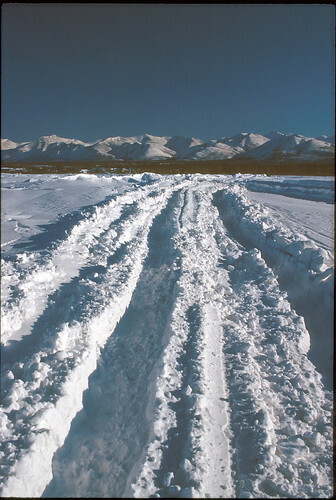 Road condition: Mixed, from fast two-lane snow to one-lane ice and bad washboard; passable in a passenger car, but high clearance and four-wheel drive might be helpful if not mandatory on the steep icy passes and sections with deep snow. Some white-knuckle stuff on the hills and corners. Heavy truck traffic on a one and a half lane road is nerve-racking, with chunks of coal on the road a constant hazard, especially at night.